Taking their name from the Portuguese explorer Ferdinand Magellan, one should see this group as wanting to take us on a musical journey of exploration. The group is composed of Trent Gardner, brother Wayne and Joe Franco. They have lined up a few guests on this release (Tony Levin, Ian Anderson and Robert Berry). 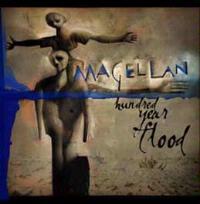 The disc, reliving moments of classic prog and creating Magellan's own variant on that sound, contains just three songs. The first of those is the 35-minute, 13 track epic The Great Goodnight. This piece, representing well over half of the album deals with the Gardners' personal loss of their brother in the Vietnam War. The album overall is quite strong, but can feel a bit too personal at times, as though you are looking in on a family matter that you are not privy to. Still, this one should please fans of the band, and those looking for quality new prog. This epic is a major undertaking divided into thirteen tracks. The cut covers a lot of textures and modes. The only real complaint about it is that the lyrical content seems a bit too personal, and although I am certain is a heartfelt tribute to their lost brother, might only appeal lyrically to members of the Gardner family - or maybe that's just me. The first movement of the piece is mostly acapella, feeling a bit like a cross between an African American church choir, Yes' Leave It (acapella take) and a barber shop quartet. The instrumental work on this is only incidental background stuff. Piano starts this, and as the vocals join, the mode is in a very emotional balladic form. After a time a prog instrumental segment in a killer timing bursts in to end the movement. ELPish keys starts this out of the fury left behind from the previous movement. The rest of the band come in and a trademark Magellan prog journey is underway, part Yes, part ELP, but still tempered with a harder edged guitar textures. This mode pulls the cut to the next section. This comes in as a resolution of the line begun in the last movement. It is essentially just one chorus. Coming in with a Kansasish style, this carries that mode for a while, then shifts to a fast fusion element. The group then merges these two characteristics into one cohesive style. A frantic, almost Dream Theaterish jam ensues after a time with a killer keyboard sound. It is this vein that carries us into the next section. A triumphant musical texture emerges here. Traces of Yes seem to merge with those DTish elements left behind, transforming it into a more melodic movement. Then the cut shifts to a new section that encompasses the new vocal segment. This one is lyrically quite evocative and covers a good amount of musical ground without moving too far from its roots. A new, vibrant expansive jam takes the cut later, then drops to helicopter and wave sounds. Atmospheric keys with vocals over top begin from there, building the cut in an emotional balladic style. The vocal arrangement here is intriguing. This movement just explodes out of the crescendo from the previous one in hard-edged prog fury. The riff on which this is based is very tasty. This is rather metallic and a bit like Kansas. It is essentially one long chorus. A keyboard type beat starts this one, then the other instruments join in a new groove. The verse is mostly vocals over top a sparse arrangement that gets a bit funky and even a little jazzy. Those vocals feel just a little like Chris Squire at times. This is one of the simpler, but strongest movements of the epic. It drops dramatically to just keys to move it into the next section. A more balladic segment with vocals and keys that call to mind church music at times, this one is another evocative one. It eventually begins becoming more hard edged and the vocal arrangement steals the show here in many ways. This has a definite accessibility and organic quality to it. It gets quite powerful and is one of the longer movements of the piece. It explodes into an expansive, Genesisish jam to crescendo into the next section. More hard-edged prog takes over here. Kansas and DT both come mind. It drops out at a point to just keys, then jumps back up before moving us on to the next step of the journey. A familiar theme from various points in the epic returns, and a new instrumental jam is undertaken. This one moves into more triumphant, resolving modes as it carries on, and a solid guitar solo appears. It then crescendoes into the next movement. Atmospheric keys and non-lyrical vocals start this. A spoken statement brings the loss to the personal, then a new prog jam rushes in. A familiar chorus returns, and the central title of the epic runs through several times. This comes out of the crescendo from its predecessor. It uses keys to herald an all-new fast paced instrumental prog excursion that feels a bit all over the place. It drops down after a crescendo, then a new riff emerges. Trent says, "hey Wayne, let's take it home", and they move this jam thorough to its resolution. Then a haunting familiar refrain returns to effectively end the whole piece. Along with a short dedication, a guitar-based segment takes it to the actual outro, working its way to the final resolution of this progression. Haunting piano enters out of the silence left behind, then a new vocal line heralds the piece on and serves as the conclusion. Ian Anderson's flute begins this one. As he works his way through, it feels a bit like Tull's Bouree at times. His flute solo makes up almost the first two minutes of the piece. Then a very brief non-lyrical vocal segment takes it followed by a dramatic neo-classical buildup. Then lush keys wash in the track's first true melody. An Emersonish keyboard flourish takes control from there, though and rushes the instrumental back to something more akin to that atmospheric mode. This serves as the outro with effects and followed by applause. Tony Levin guests on this one. An acoustic guitar based balladic mode begins the cut and runs thorough a verse and chorus before any other instruments join. Even then it is just in the form of icing on the cake. After the next verse, though, Levin pounds in, and the cut is revitalized and turned on its head. It is suddenly a rather funky groove that has a killer texture and vocal arrangement. This gets downright fun as it carries on. Who knew prog could be fun? After a time it drops back to n acoustic guitar based mode that carries through for a while. A stop followed by chaotic percussion signal a new jam, the instruments tentative at first, then seeming to gain confidences. This becomes another strong groove, albeit with a timing that can be a bit hard to latch on to. It ends abruptly, then the verse elements re-emerge. Eventually that drops away and the opening elements return with more keys as icing this time. Then the firs Levin based excursion returns - fun times are back again. They build quite nicely on this segment, screaming it forward and use it to link to another percussive based section that serves as the outro. A couple minutes of silence are tacked to the end followed by Trent Gardner thanking the listener for staying along that far and dedicating the disc to the memory of his brother.